Baby Nursery Organizer & Diaper Caddy by Little DMoose – Plastic Back Support for Added Stability, Reinforced Shelves, Strong Velcro, Smart Hooks and Eyelets for Hanging. HomeBath and PottyDiaper Stackers and StorageBaby Nursery Organizer & Diaper Caddy by Little DMoose – Plastic Back Support for Added Stability, Reinforced Shelves, Strong Velcro, Smart Hooks and Eyelets for Hanging. IMPROVED LONG TERM STABILITY – Traditional nursery organizers start sagging and breaking down due to weight and use. However, our nursery organizer boasts a REINFORCED PLASTIC BACK SUPPORT & PLASTIC REINFORCED SHELVES for each pocket to ensure your stuff remains in place and doesn't fall off. MULTIPLE HANGING OPTIONS – Our nursery organizer comes with strong Velcro with long straps & smart hooks to ensure you can hang it on any crib, changing tables and dressers. If these are not the options, you can use the eyelets to hang it on the doors and walls. LIFETIME GUARANTEE – Our motto is “Give them Quality. That's the best kind of advertising”. We want happy & satisfied, that's why we're giving you a full refund or replacement for life to ensure premium craftsmanship although we are always happy to resolve whichever problem occurs. The most durable Nursery Organizer currently available! Do you have trouble finding your stuff and keeping your toddlers entertained during diaper changing? Then Our Nursery Organizer is designed just for you! It can declutter your nursery and make diaper changing fun and stress free!! Why Our Nursery Organizer is Different? Two pockets to store creams, moisturizers etc. Our Stocks Are Going Away Fast at This LOW INTRODUCTORY PRICE, So Secure Yours Now by Clicking Add To Cart and Enjoy your Diaper Changing Experience Stress Free! 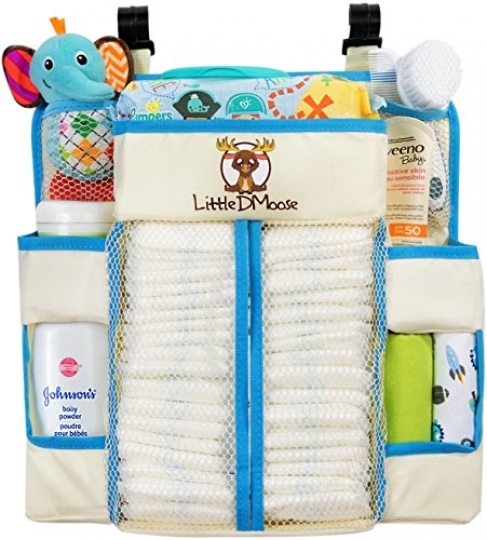 Specification: Baby Nursery Organizer & Diaper Caddy by Little DMoose – Plastic Back Support for Added Stability, Reinforced Shelves, Strong Velcro, Smart Hooks and Eyelets for Hanging.